Fragrant and sweet, local melon is hands-down one of my favorite things about summer. So when I arrived at the farmers’ market this weekend and was greeted by the perfume of melon, it was difficult to contain my excitement. I could tell by the aroma that this melon wouldn’t last long; I could tell it was ripe, but it was almost bordering on overripe. In other words, it was perfect at that moment. To extend its life just a bit, I decided to turn it into a salad by adding the strawberries I picked up from the market, and some blueberries I had in the fridge. The mint came from my own garden, and the rest? Well, the rest of the salad simply came together by looking through my cupboards and fridge. When I say this salad is simple, I’m not kidding. But I firmly believe that when you have superior produce, it does not need much adornment. 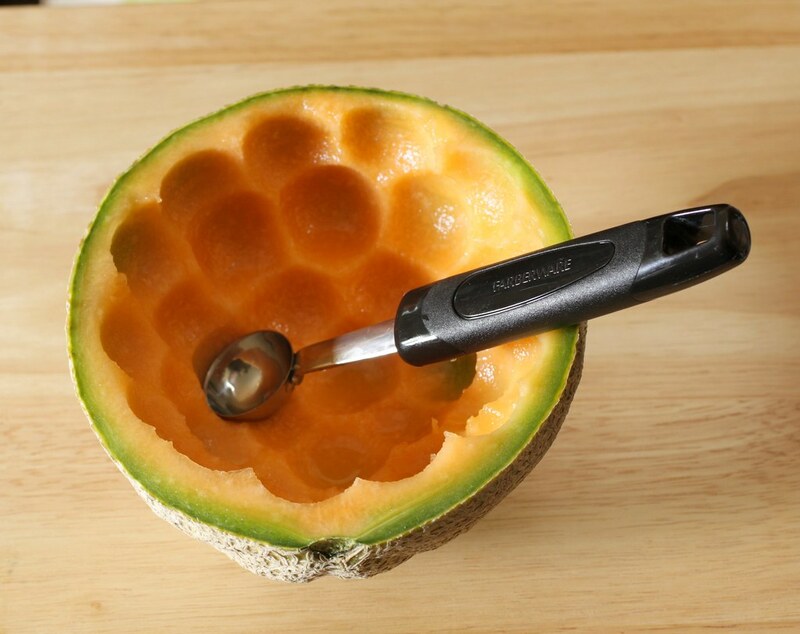 Using a melon baller, cut the melon and place pieces in a large bowl (you can also cut the melon into chunks). Half or quarter strawberries, depending on their size, and add blueberries to the salad. Add the orange zest and juice to the bowl. Run the bottle of honey under hot water or microwave for 5 to 10 seconds. 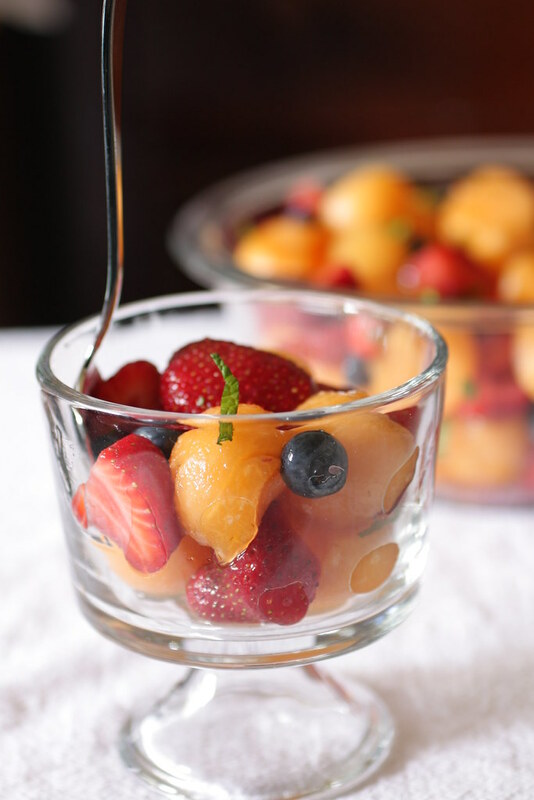 Pour honey and rum over the fruit, and add a pinch of salt. Stir carefully to mix. Garnish with mint. I love fruit salad. They are so yummy and healthy. Can’t wait for summer to make lots of it. Ellie, I feel a little bad posting about the summer salad, but then I remind myself that I’m the one currently stuck with the humidity (and bad hair)…my turn to drool over your summer treats will come in a few months. 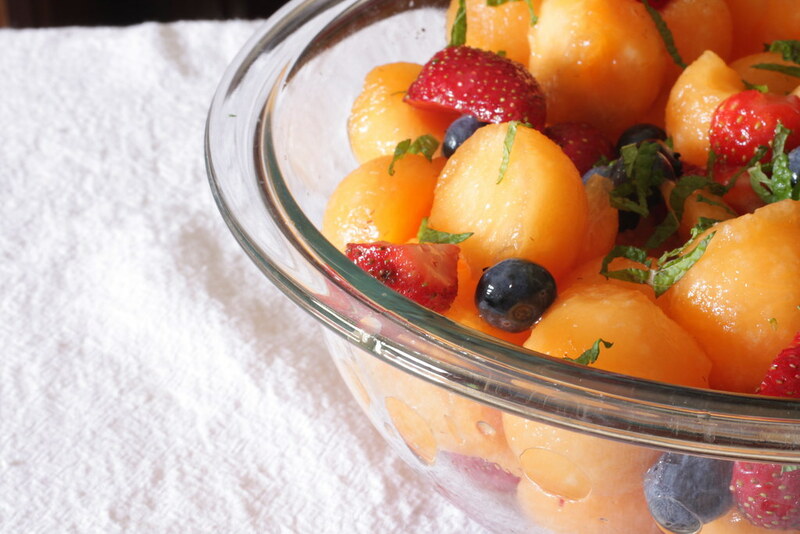 Fruit salads are my favorite way to cool down in the summer. This looks delish! Tanya, I couldn’t agree more. Thanks!